This bad apple post emanates from the editor, Kathie Hodge. Welcome to Supermarket Mycology, an irregular series of posts on fungi you might well encounter in your everyday life. We’ve already kicked things off handsomely with time lapses of rotting strawberries and lemons, and of course there was the cautionary tale of the moldy maple syrup. Fungi are more ubiquitous than most people imagine; supermarkets house a surprising number of both good (tasty or useful) and bad (unwanted or ugly) fungi. 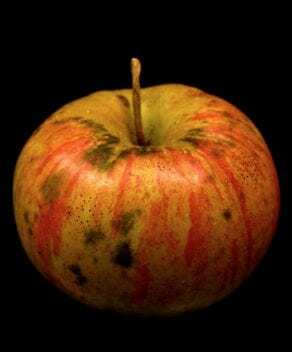 Today’s fungus grows on apples, causing a disease named flyspeck. The word flyspeck is a polite way to say fly poop, but that’s not what’s going on here. To flyspeck something is to scrutinize it in minute detail, just as I will shortly flyspeck this blog post for tyypos. A flyspecked apple is something else altogether, though you often do have to look closely to see the fungus. The little dots on our apple are the typical sign of flyspeck disease. They’re the minute fruiting bodies of the fungus Zygophiala jamaicensis. (AKA Schizothyrium pomi). They, and in fact the whole mycelium of the fungus, are growing superficially on the cuticle of the apple. This image shows a pretty bad case. Most of the time, my flyspecked apples have just one or two artistic little aggregations of specks on them. I personally have eaten very many of these, with no apparent ill effect. You have too (unless you are one of those compulsive apple peelers, like my old neighbor Betty2). Moving beyond flyspeck, which often isn’t all that noticeable, we come to sooty blotch. In our image, you can see this disease as diffuse dark clouds and blotches. It too is caused by a (literally) motley crew of fungi related to the flyspeck fungi. Sooty blotch fungi also grow superficially on the apple; both sooty blotch and flyspeck favor the same, humid conditions for their development, so we often speak of them together (SBFS). Although neither disease affects the quality of the apple flesh, apple growers dislike them because, well, would you buy an apple that looked like this? 1. JC Batzer, ML Gleason, TC Harrington, LH Tiffany. 2005. Expansion of the sooty blotch and flyspeck complex on apples based on analysis of ribosomal DNA gene sequences and morphology. Mycologia 97(6): 1268-1286. 2. And let me just take the opportunity to say again, Betty, how sorry I am that my dog ate your box from Land’s End with the blue dress in it, after it was misdelivered to my house. The dress wasn’t much damaged by the dog, but I feel really bad about the truck that ran over your mailbox after we’d put the chewed box into it–apparently a bee had gotten into the cab. Just not our lucky day, I guess. Did you ever get a new dress? 3. D Cooley. 2007. Summer diseases. Scaffolds Fruit Journal 16(19). Kent has kindly described his methods for making interactive Object VRs for us all. Check out his website.